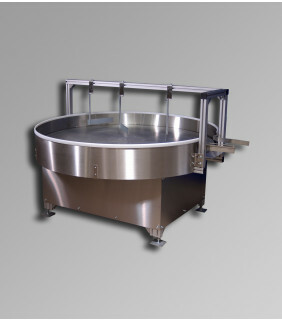 ABA manufactures both in-feed and out-feed rotary tables to help streamline automated filling lines. The implementation of a rotary table improves speed and output and eliminates the need for constant operator interaction with loading and unloading of containers. 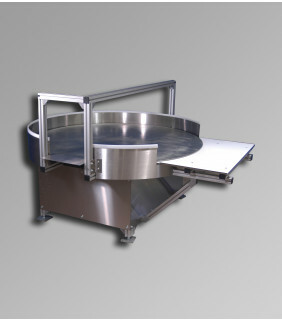 All of our rotary tables are constructed from an aluminum frame with a plated circular feed table or are optionally available with stainless steel frame and parts. Infeed tables allow operators to pre-load large quantities of containers which are then automatically fed onto the conveyor. Rotary infeed tables increase speed, efficiency, and output and give operators the time they need to attend to other aspects of the fill cycle. Out-feed tables collate containers at the end of the fill cycle, eliminating the need for an operator to receive each filled container as it comes off the conveyor. Our out-feed tables are outfitted with a stainless steel packaging table topped with UHMW plastic for easy removal of filled containers. The end results are faster and more consistent production levels. For more information on our rotary tables or to work with us to design something that will be the most efficient for your fill line, please contact one of our representatives today.